PomPom's classic twin-stick shooter mutates onto tablets. 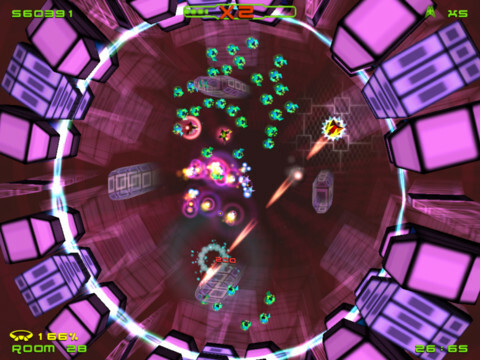 While the original Mutant Storm was released some years before its incarnation on the Xbox 360, it was on that platform that the game really grabbed the public's attention. Following in the footsteps of Bizarre Creation's sugar-rush, free-form Geometry Wars, Mutant Storm's decidedly goal-driven gameplay (along with a far darker world) made it just as compelling a game experience. Mutant Storm for iPad uses the touchscreen twin-stick shooter controls we've grown accustomed to on tablets: movement controls are on the left, firing on the right, with options to flip if you're left-handed. Unfortunately, there's a certain sense of smudginess to the movement and the two controls occasionally feel out of synch with each other. It's not impossible to play by any means, but you may find yourself realigning your thumbs from time to time in order to maintain positional presence on the screen. The game maintains a solid 60fps. Over in the settings, we tweaked, fiddled and refined the controls endlessly to find the perfect balance between responsiveness and performance but with little improvement. 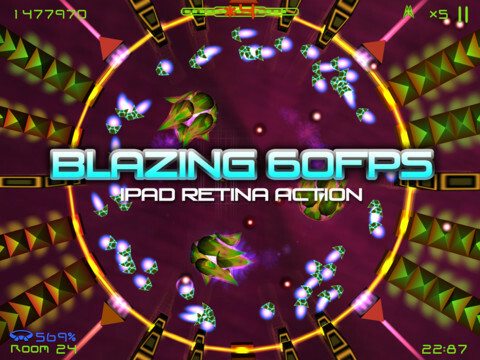 Mutant Storm's controls simply lack the fluidity and natural response that developer Radiangames has refined with their many iOS shooters. It's a pity because it goes without saying that precision control is as essential to this game as Mutant Storm is to twin-stick shooter fans. What Mutant Storm does have however is atmosphere in spades. The grim and bleak arenas are filled with the most imaginative cornucopia of menacing, metallic, robotic enemies imaginable, and the Alien-esque audio stabs tie in perfectly with the brooding music. There's a huge amount of variety to be found in the enemies too, from the turrets, to the mutating monsters, and there's always a particular strategy required to successfully survive each level. If you're struggling with a level in Tally mode, you can always tune the difficulty down. There are two modes in the game: Adventure and Tally. The first is a hard-as-nails romp through the game's 89 unique levels where you'll be armed with three lives and handful of bombs. Every tenth level that you complete becomes a checkpoint that rewards you with an extra life and a bomb. In the unlikely event that you reach level 89 in one go, you can pick up your next game at level 10, level 20, level 30 and so on. Regardless of the mode you play, the action's available in a wide variety of different difficulty martial arts "belts", from the easiest White setting to the agonizingly tough Black. 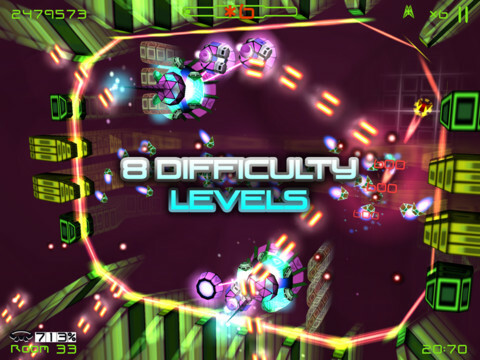 In contrast to Adventure mode, Tally tasks you with taking the game on one level at a time, clearing each level as quickly as possible to build an overall high score. You can also switch between difficulty levels if you're finding the difficulty too much to bear on a particular level. It's not the perfect incarnation of Mutant Storm, but it's faithful enough. Mutant Storm's controls may need a little refining, and hopefully a future update will add some much needed precision. While they're currently the only issue holding the game back from the greatness established in previous incarnations, they're by no means unusable (and far from the worst offender on the App Store). Despite its flaws, Mutant Storm is still an easy enough recommendation for twin-stick junkies. What's Hot: A faithful recreation of the Mutant Storm experience. What's Not: The controls need further polish.